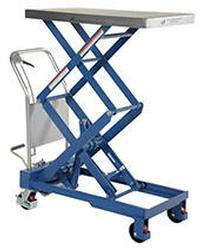 Hydraulic Elevating Carts are well suited for manufacturing and distributing industries. 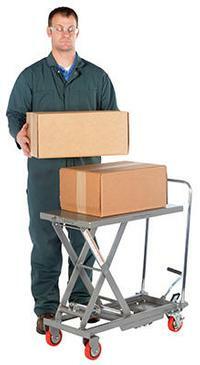 Material can be easily loaded onto a cart from a table, lowered to safe transporting height, and raised to unload ata destination. Foot pump includes a soft-lowering down valve for precise positioning and the perfectergonomic height. 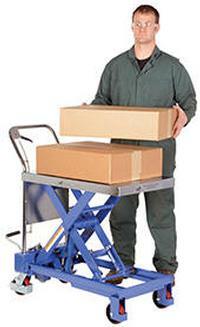 The unit rolls on (4) polyurethane casters; two (2) swivel with brakes and two (2)rigid. 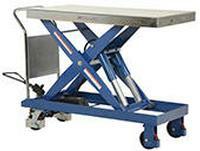 The tables can be raised and lowered with a single speed foot pump, two speed foot pump or atwo speed auto shifter that automatically shifts when the table is loaded. 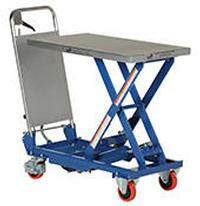 Steel construction with chrome platform and handle on all models, except model V-CART-200-ALUM which includes an aluminum platform surface.